Published: Faber, 1976. ISBN 0 571 10931 4 [hardback; pp.363]. 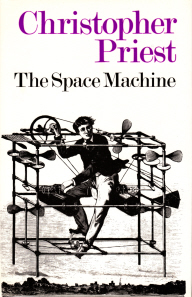 The last paperback edition was a joint publication with A Dream of Wessex (as “Omnibus 1”; Earthlight), but currently out of print. Also available in translation. No US edition. Written as a tribute to H.G. Wells, The Space Machine conflates images from two of his greatest novels into a story that reveals something of Wells’s own world. A young Victorian couple accidentally operate a time-space machine, and are flung not only into the future but also across the void of space. To return to their own time they have first to undergo great changes. The cover illustration is from the o.o.p. Faber hardback edition. For the time being the Amazon link will lead to the Audible download, but a Gollancz paperback reprint is due soon. CP is now Vice-President of the H. G. Wells Society.